In Defense of Food: An Eater’s Manifesto is a must-read. 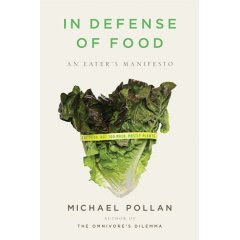 Michael Pollan, the author, first explored the premise of the book for some NY Times contributions and, with time, a book project was born. A sentence that peeked my curiosity is the following, “the tangible material formerly known as food.” While it is important to be aware of what one puts in one's system, there is more to the items one picks to masticate than the caloric intake. whatever happened to simply enjoying nutrition, really, sounds like a good one to read. ths. This title seems to provide some balance in the discussion and that can be nothing but good. It's a balanced take on food. About time. We should, first and foremost, go for balance before going for anything else. The BBC show sounds interesting. If Netflixable, I will start watching it. Thx for the post! ha. what Xan wrote: 'Beware sharp knives and even sharper tongues...' is my sentence of the day. and, of course, i concur fully. food is first and foremost an art form. this book will be read. by me. and mine.